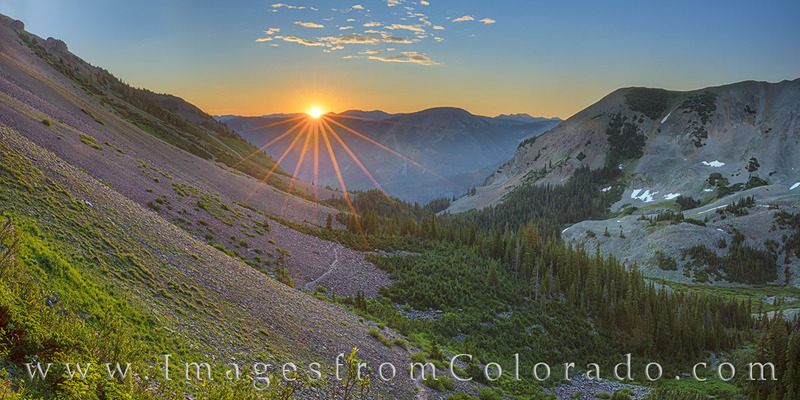 This panorama was taken on the trail in the Maroon Bells Wilderness Area that leads to Cathedral Lake and up to Electric Pass. After a series of steep and taxing switchbacks, we arrived at this perch above a beautiful valley just as the sun was cresting the distant peaks. Not far on our upward path was the beautiful Cathedral Lake. Eventually, we’d reach Electric Pass, and were rewarded with views of several 14ers, 13ers, and a landscape of Rocky Mountains. Photo © copyright by Rob Greebon.